Today, Oct. 18, the United States Mint opened sales of its 2018 Limited Edition Silver Proof Set. Restricted to 50,000 units and priced at $144.95, the set contains eight silver coins bearing ‘S’ mint marks to designate their production at the San Francisco Mint. Each of them has a collector proof finish with frosted designs that attractively contrast against mirror-like backgrounds. Seven of them are in 90% silver while the other is .999 fine. The five quarters, issued as a part of the U.S. Mint’s ongoing America the Beautiful Quarters® Program, have designs unique to 2018. The eight coins combine to 2.338 ounces troy ounces of silver for a melt value of $33.96 based on Thursday’s LBMA silver price of $14.515 per ounce. Annually issued, these sets are one of the U.S. Mint’s premier products. They have enjoyed popularity over the years, supported by the extra attention given to the presentation packaging. Last year’s set hung around for about 32 hours before selling out. 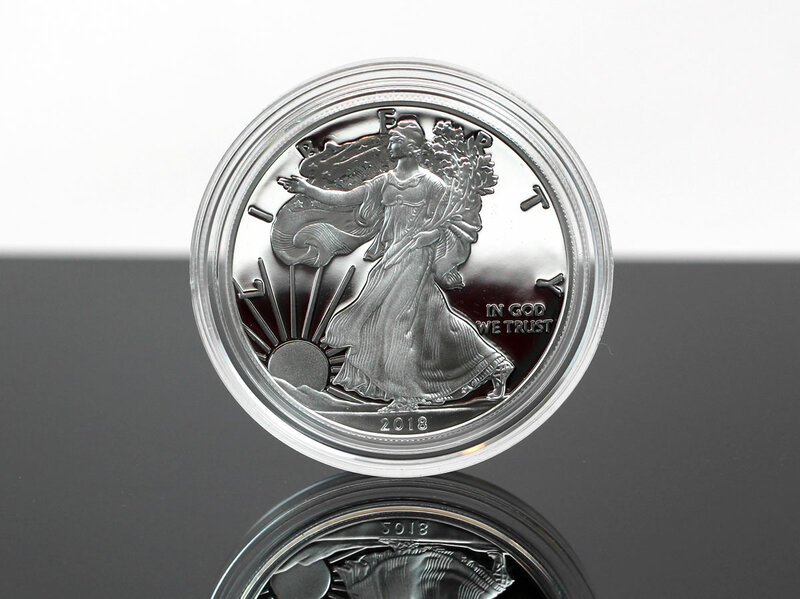 (The quick sellout was helped by its 2017-S Proof American Silver Eagle which had been available in just one other product that previously sold out.) Other prior-year issues also reached max sales. Coins in the set are not exclusive to it. The 2018-S Proof American Silver Eagle is sold separately for $55.95 and has current sales of 134,180. A CoinNews photo of a 2018-S Proof American Silver Eagle. The .999 fine silver coin is sold individually for $55.95. It is also one of the 8 coins within the 2018 Limited Edition Silver Proof Set. 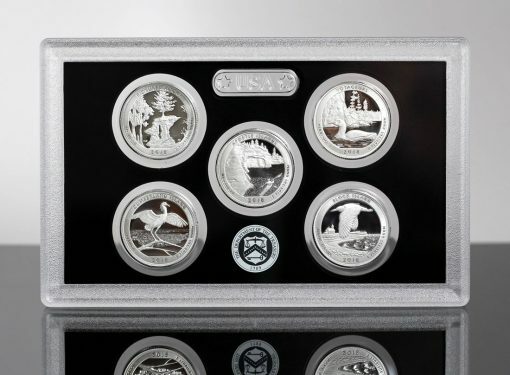 The other seven coins are available in the larger 2018 Silver Proof Set. It’s priced at $49.95 with 246,318 sold so far. A CoinNews photo of this year’s five 2018-dated quarters. These are silver editions released earlier in the separate U.S. Mint 2018 America the Beautiful Quarters Silver Proof Set™, which is available for $33.95. These same quarters are in the set released today. Then there’s a smaller set of silver quarters that goes for $33.95 and has current sales of 67,459. 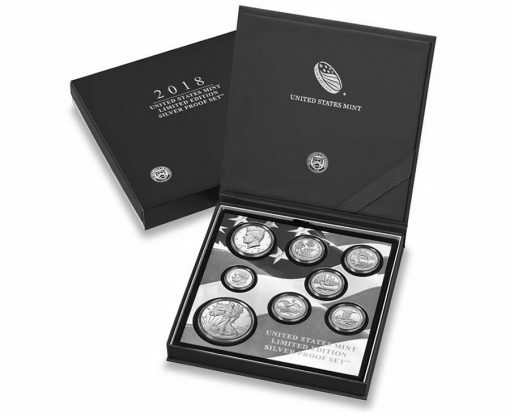 Order the 2018 Limited Edition Silver Proof Set straight from the United States Mint via this product page, or call 1-800-USA-MINT (872-6468). Like last year, the set has an order limit of two per household. Last year’s limit was lifted after the first 24 hours. Last years(2017)offering had no HH limit in place. Thanks. I edited the article to reflect that last year’s order limit was removed after the first 24 hours. What makes this set limited other than the packaging. Are not all the coins available in other sets or singly? Rippppp offf……who cares USM…. On Ebay a 2017 “Ltd. Ed.” proof set just sold for $50!!!!!!! That is correct. The cheapest the full set goes for on Ebay is $122.50. The basic fact is you’re paying an extra $35.05 for these coins and you don’t get the Lincoln Cent, Jefferson Nickel, or Native American $1 coin. So it’s about an extra $45 for the package. The only reason sets like these are popular is because of the label these coins will get when graded. For example, look up Silver Eagles Limited Edition. The premium on some of these is unreal. You are so right about that. Some people today are buying the “label” instead of the coin itself. There’s a saying that goes: “BUY THE COIN NOT THE LABEL” Well that’s all it is now, just a “saying” and not advise that’s taken to heart. For new collectors that can be confusing and costly. Another added problem with some labels is the signature some have. Are we coin collectors or collectors of signatures? Our hobby is going through so many changes that are not for the better. Hello Richard. So interesting I know. I did see mike on tv with these and was like what. Definitely corruption in the hobby and favoritism to make a profit. so ridiculous. I also find it intersting like the selling of the Palladium eagle and jyst hiw the metal was on the rise. so convenient!! Not boring at all sir. Thank you for posting this. I myself already knew about Mike Mezak’s dealings and how crooked he is. But not everybody knows about how bad he really is and they should know. Not boring at all, Millhouse. Very informative. Thank you. By the way, the “2018 10-Coin Reverse Proof Set” that are graded RP70 from ANACS, that Mike claimed will sell out quickly on HSN are still available. Are people finally catching on to him? About this set. How can an individual or company have access to hundreds if not thousands of this set days or week before they are suppose to go on sale to the public. Especially when there is a supposedly 2 set maximum per household for the first 24 hours? Thanks again Millhouse. I would like to talk to you some times about coins. Also wanted to know if you know any reputable dealers in my area. I live in the Cleveland Ohio area. I understand dealers need to make a profit. Its the way life goes on. I do the same doing a little side work in the HVAC work. mike mezack is also having a fire sale today on the rarest burnished 2017 w silver eagle with final mintage at 176,739 according to mike thats 20% lower then any other eagle except the 95w at 30,000,he fails to mention the 2018w at 121,003,for the last five months is not too good,they sell between 500 to 1000 a week.to reach 2017 numbers they would have to be on sale for more than another year which i don’t think will happen. ask mike he says he can’t predict the future yeah well me either. 10/18/18 to 10/21/18 limited edition silver proof set sales 24,990 wow thats pretty limp they should have put a in D silver eagle in there that would have stirred the pot a little,wishful thinking.